"You know what would look good here? It's crunch time in the NHL, as teams fight desperately to qualify for the post-season. These days it seems like every game matters, and every point is crucial. And with mere weeks left in the season, the races for a spot in the post-season are closer than ever. Who'll be left standing? Here's a scouting report for seven teams involved in fierce battles for their conference's eighth and final playoff spot. The good news: New coach Jacques Lemaire's "neutral zone trap" defensive system has so far proven more effective than previous coach John MacLean's version, the "neutral zone high-five the opposing forward on the way by while telling him where Brodeur's weak spot is today". The bad news: Thanks to poor start, were actually mathematically eliminated from the 2012 playoffs in early December. Player to watch: After recently hiring a Russian translator for Ilya Kovalchuk, the team discovered he'd been trying for months to tell them that the sticks they kept giving him were for the wrong hand. 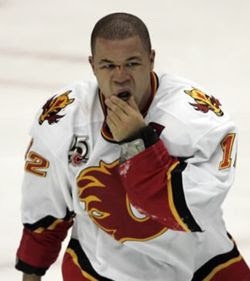 The good news: The players are strongly motivated to make the playoffs, if only to distract Jarome Iginla from making more terrible bank commercials. The bad news: Every time coach Brent Sutter tries to give an inspirational "Let's get out there and make the playoffs" speech, he's interrupted by Jay Bouwmeester asking "get out there and make the who what now?" Player to watch: Matt Stajan, preferably while wearing a Dion Phaneuf jersey and laughing hysterically (Leaf fans only). The good news: Have wisely arranged to play most of their remaining games against teams from the Eastern Conference, who are all terrible. The bad news: None of the players can remember if the franchise tradition is to contend for the Stanley Cup in odd-numbered years and finish dead last in even-numbered years, or vice versa. Player to watch: Eric Staal, assuming you're looking for somebody to draft a terrible team in next year's office fantasy league. The good news: New billionaire owner Terry Pegula has energized fans by announcing many new promotions for the remainder of the season, such as "leave a duffel bag stuffed with hundreds in the referees' locker room night". The bad news: The city has had so much good sports luck over the years, they're probably due for some sort of bad break. Player to watch: Ryan Miller is struggling through an off-year, in the sense that he occasionally allows the other team to score this season. The good news: Headed into last night's action one point out of the final playoff spot, which in the Western Conference means they're also one-and-a-half points out of first place. The bad news: Haven't looked good recently, according to that one guy you know who accidentally watched one of their games. Player to watch: Mike Fisher, says your wife, creepily. The good news: Many observers consider them one of the five best teams in the Pacific division. The bad news: Disturbed teammates report that an aging Teeme Selanne now throws a glove into the air and pretends to shoot it down every time he successfully passes a kidney stone. Player to watch: Ray Emery, who has plenty of experience helping the Ducks win in the postseason. The good news: The struggling power play has been improved by the recent realization that you're actually allowed to put an extra guy out there. The bad news: Teams have begun to exploit James Reimer's weakness: skating towards him while yelling "Hey, don't forget that you are James Reimer". Player to watch: Tomas Kaberle, as he watches the playoff run from afar with his face pressed sadly against his bedroom window. Optimus Reim has no weaknesses. He just purposefully lets in goals sometimes so that the opposition builds a 'book' on him that is actually false, and he'll go the rest of his career stoning everyone left, right and centre. Can I substitute a Phaneuf jersey for an Aulie jersey and still laugh hysterically at Stajan? Autobots!!! ROLL....hmmm....over and play dead! Also, a "Bubble Team" would mean a chance at making the playoffs, why are the Leafs there? "Tomas Kaberle, as he watches the playoff run from afar with his face pressed sadly against his bedroom window"
True story, as I was reading this sentence, I overheard "Love Hurts" by Nazareth on a co-workers computer, and laughed hysterically at the mental image. still going for that cheap "Nashville has no fans" heat eh? tsk tsk. I am so glad I found this blog a few months ago! It's always timely and hilarious! Thank you so much! Hahaha! Too damn good. Loving it as a Ducks fan! Haha that Scotiabank commercial is awful. Hey, aren't you... with those guys. Yeah, Not everybody from Peterborough is trash. Just sayin'. Corey Perry is a native of Peterborough too. 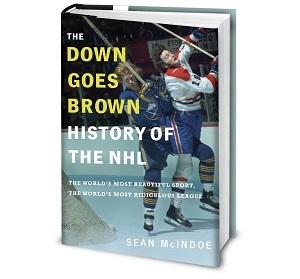 I confess I haven't read DownGoesBrown long (a couple months) but why does it say its a Toronto Maple Leafs blog? DownGoesBrown is that rarest of Leaf fans, a Leaf fan that knows there are other teams in the league...and pays close attention to them. I usually chuckle through articles, but this one killed me. Hold it now. I was in Nashville Saturday. Beautiful sunny afternoon, and I saw a ton of hockey fans taking in the pre-game sights down on Broadway.........wearing Wings sweaters. The Kings have dropped 3 of 4 points since they were omitted from this. I demand that you find some way to make fun of them and get them back to their winning ways as a result. Loved the Ray Emery comment! Keep it up. Take the Quiz: Did you make a good trade?